After yesterday's rest day, I was curious how my legs would perform today. I was a little bummed to find that my riding was pretty sluggish heading out of town. After a few miles, I looked down and noticed that my rear tire was flat. Alex and I pulled over to repair the flat. This is the first flat I've had on this set of tires. The tires are Schwalbe Marathon Plus tires, and I'm pretty darn impressed with them. The were new before I started my 3,000+ mile cross-country trip last summer. I considered replacing them before this trip, but an inspection of the tires suggested they still had some good life in them. 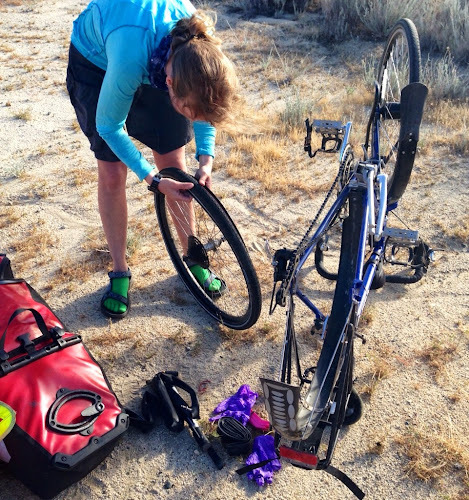 We pulled the spare tube out of my saddle bag, arranged it within the tire, and then proceeded to inflate the tube. But the air wasn't holding. What the heck! We took the new tube out to inspect it and noticed that the tube already had a few patches on it. Oops, I guess it wasn't a new tube after all! And apparently it had at least one additional hole that needed repairing. In experiencing zero flats on my last long tour, I guess I've gotten sloppy with my tire repair kit. We ducked out of the wind so that we could better inspect the tubes and find the air leaks. We identified the holes in both tubes and patched them. I'm not quite sure what caused this flat, as it didn't appear as though anything had punctured the tire. We'll see how the tires continue to hold up on this trip. Fortunately, as soon as my tire was fixed, the sluggishness evaporated from my legs. I guess it was just pedaling on a flat tire that made my riding seem so difficult. Perhaps taking a rest day is okay after all! Today's ride was my favorite thus far. Less than twelve miles outside of Lake Isabella, we passed through the town of Kernville. Had we known what this town was like, we would have spent our rest day here. It was a cute little town, with cute little restaurants and cute little stores. And there were tons of adventure outfitters operating out of Kernville. After passing through Kernville, we rode along the Kern River through the canyon for awhile, ever so gently gaining elevation. It sure is nice to ride along a river -- the sound of the water is soothing, and it's generally a bit cooler. Riding along the Kern River. We had planned on camping at a USFS campground just over 30 miles outside of Lake Isabella, but it was barely noon when we reached the campground, and we had more cycling in us. We rode into the camp anyway, to use the restrooms. As we were stepping off our bikes, we heard a camper call out, "Hey bikers, would you like a cold drink?" Heck yeah, that sounds absolutely great! And so it was that we met Jeff, a camper who resides in Studio City. He has spent the last eight days at the campground, fishing for trout. 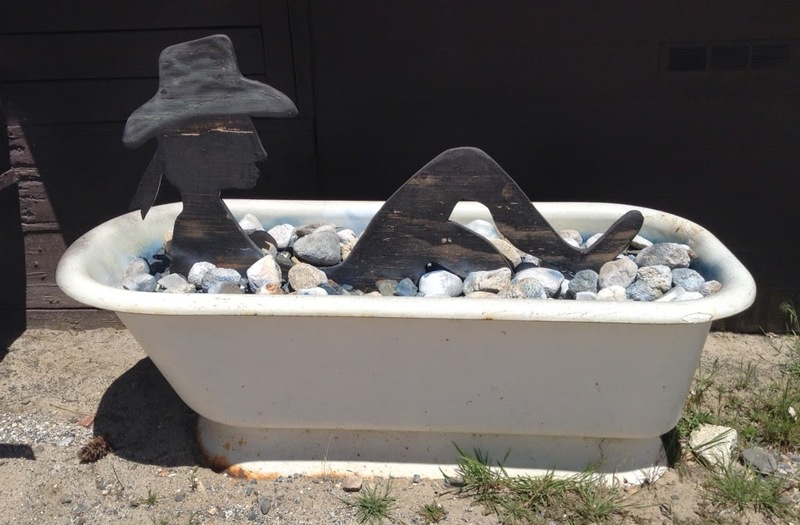 He loves the area so much that he has returned to the campground every year for 45 years. We enjoyed Jeff's iced tea (with ice cubes!) as he told us about a cyclist from Australia who had passed through the campground six days ago. Ron, our Warm Showers host from Palmdale, had also mentioned a recent contact with an Australian cyclist. We wondered if this might be the same Australian. 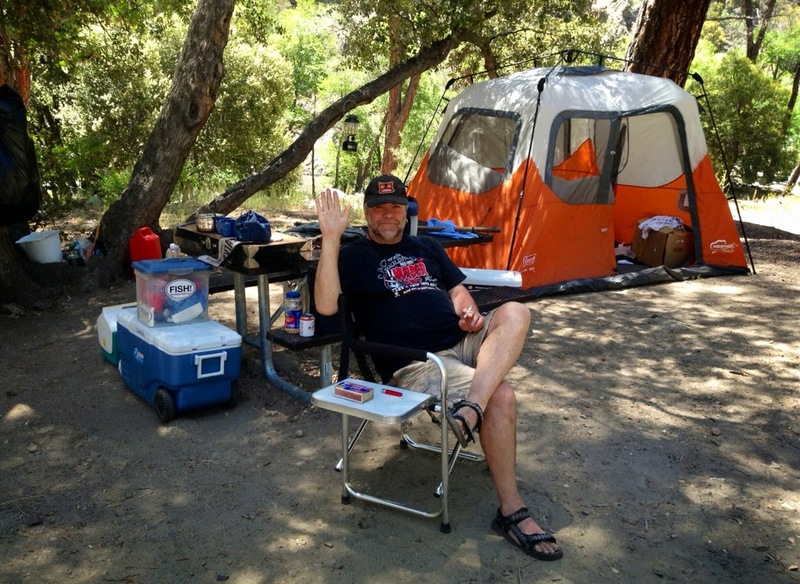 After guzzling down our refreshing drinks, we were back on the road, cycling another 16 miles and climbing another 3,000 ft to the Redwood Meadow Campground. 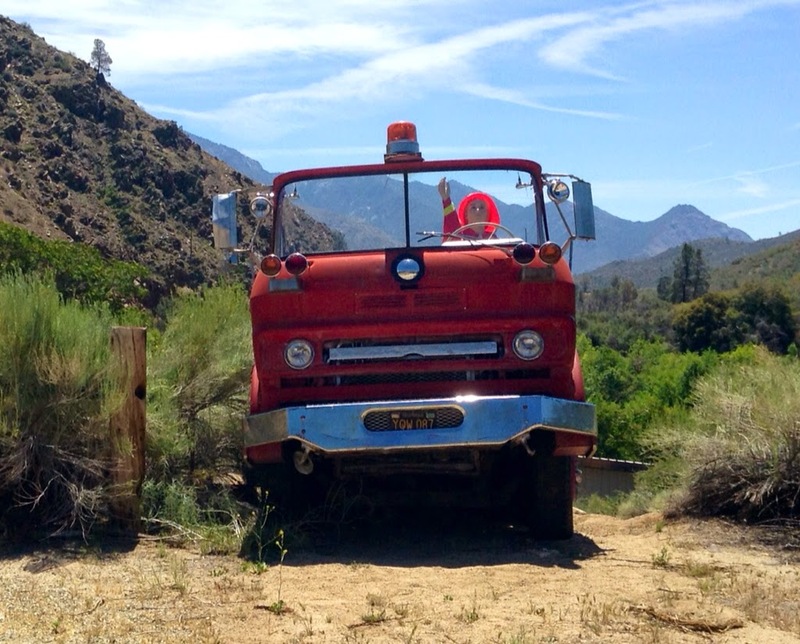 An old fire truck on the side of the road. I wouldn't have minded joining this handsome cowboy for his afternoon bath. 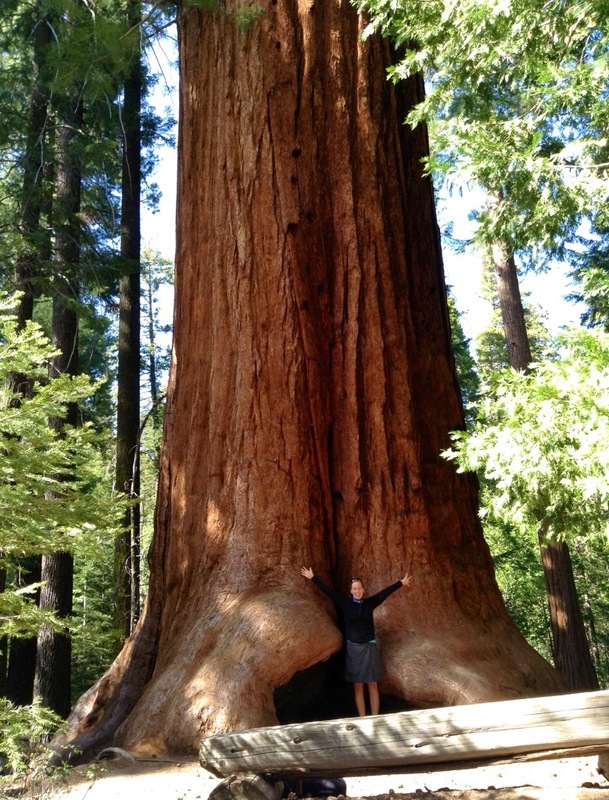 The Redwood Meadow Campground is located across the road from the Trail of 100 Giants. The trail is located within the Giant Sequoia National Monument. 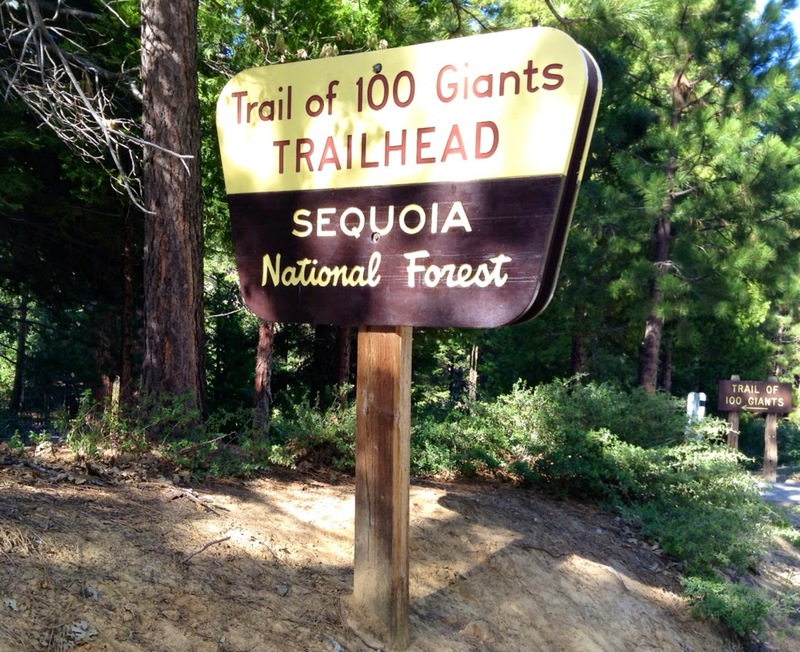 The trail leads through a grove of trees, which contains 125 Giant Sequoias greater than ten feet in diameter. The Trail of 100 Giants. The largest Giant Sequoia in the grove is 18.26 ft in diameter, 245 ft tall, and 1,500 years old. The largest Giant Sequoia in the grove. I love the bark of the Ponderosa Pine -- it looks like giant puzzle pieces. 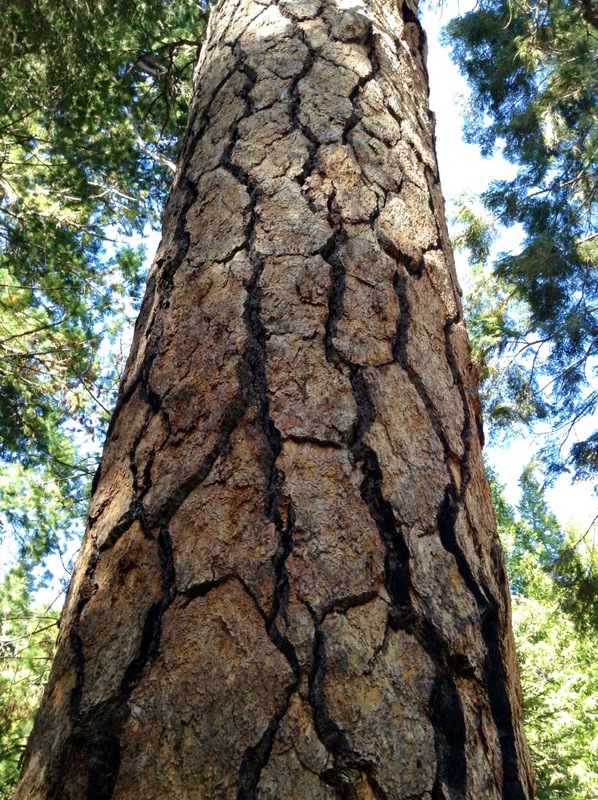 The bark of a Ponderosa Pine. This tree is known as the "Goose Pen." 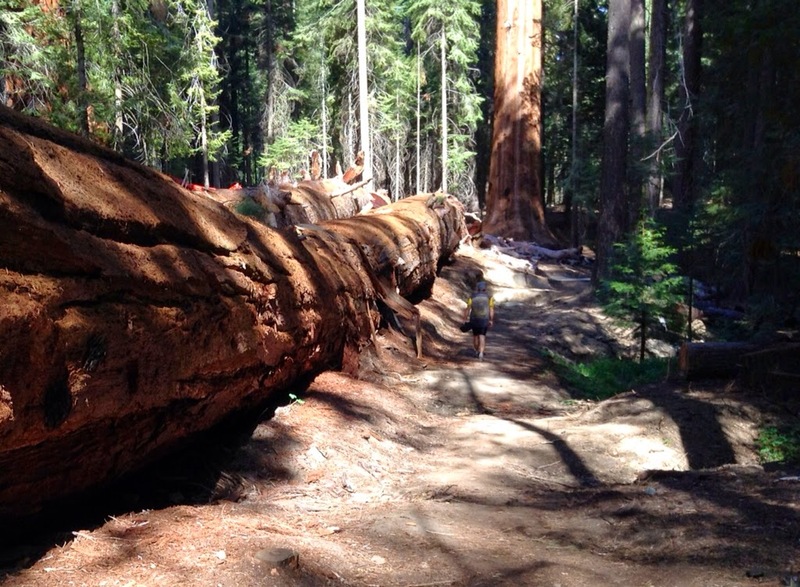 It's actually three Giant Sequoias that have grown together. If you walk inside of the trees, you'll find some log steps. These steps lead to an opening in the trunks, about eight feet off the ground, where you can peek out. Me, in the middle of the Goose Pen. These two Giant Seqouias, which had grown together and which stood 283 ft tall, fell on September 30, 2011. 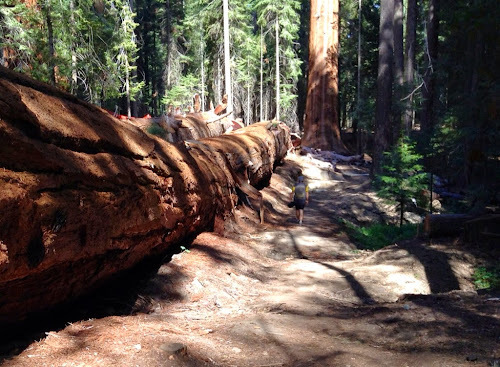 The fallen sequoias. To provide perspective, Alex is standing to the right of the trees. 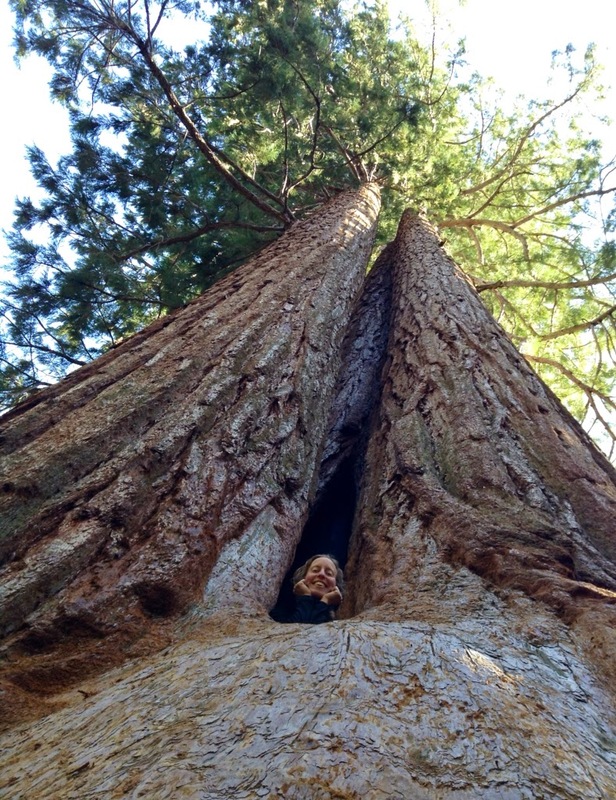 Surprisingly, the roots of the Giant Sequoias are only about six feet deep. The shallow roots make the trees susceptible to being blown over in high winds. It's surprising that so many of the standing trees are as old as they are! 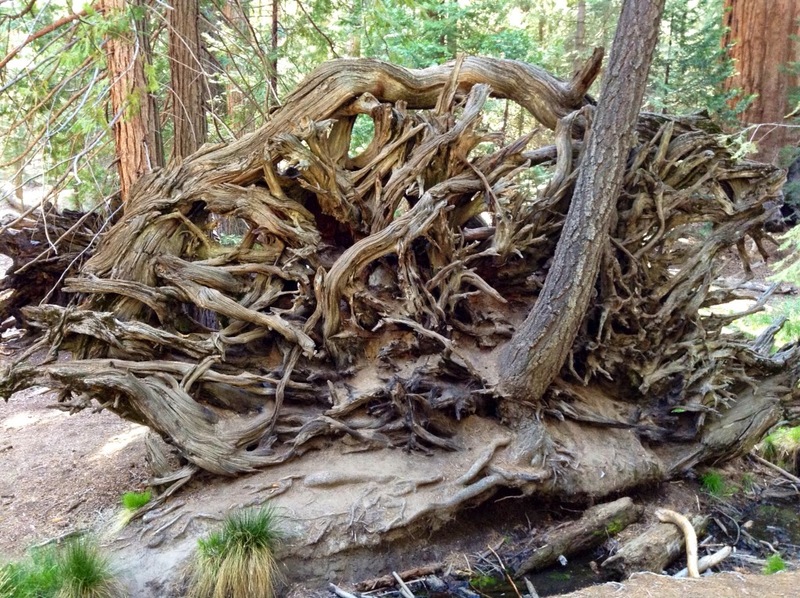 The tangled roots of a fallen sequoia. 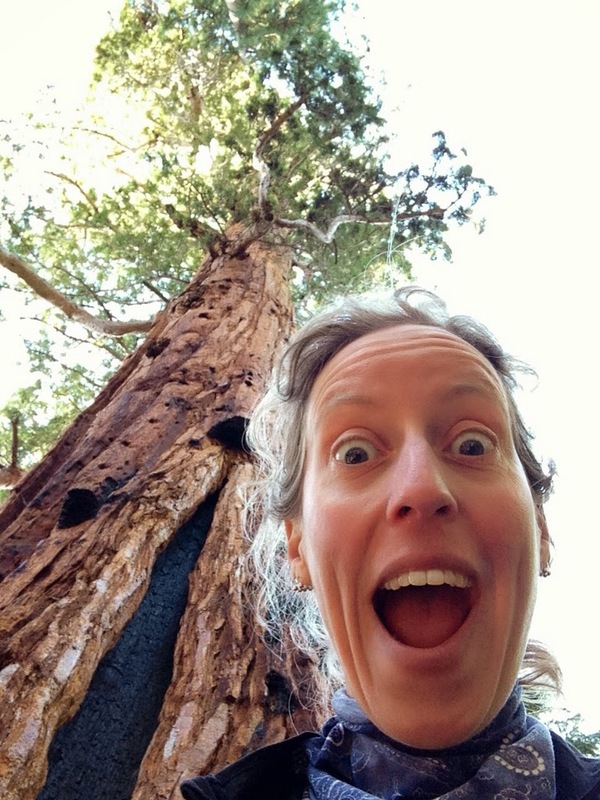 By the way, did you know that the word "sequoia" is the only word that contains all five vowels? In crazy admiration of the Giants! After walking the trail, we biked the short distance to the Redwood Meadow Campground. The gate was closed, indicating that the campground was closed. But we wheeled our bikes around the gate, found a perfectly satisfactory site, and made ourselves at home. The elevation of the campground is about 6,200 ft, and so it started to get chilly as the sun lowered in the sky. We quickly ate dinner and crawled into our warm and cozy tents for the evening. This is definitely my favorite camping experience thus far on this trip. As a girl who loves trees, it feels great to be out of the desert and sleeping amongst one hundred giants! Wow, I love that photo of you in the Goose Pen! It is really neat how many people have reached out to you guys and offered you a drink, hospitality, etc.! Whenever I'm feeling sluggish I look down and check my tires. I'm always disappointed to discover that they're not flat and I'm just slow. Ha! You, sluggish? I don't think so! You're a powerhouse on the bike!